At one time, the ABC drama was billed as the new Lost. Unfortunately, FlashForward hasn’t gotten as warm a reception as the network would have liked. While Lost will soon say goodbye after six seasons, FlashForward will surely end after just 22 episodes. 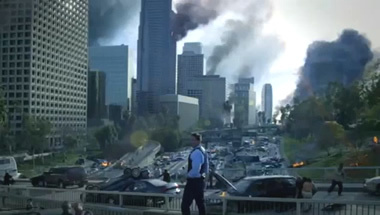 FlashForward begins as the world’s population blacks out for 137 seconds and they “flash forward” to see visions of their lives six months in the future. The series’ ensemble cast includes Joseph Fiennes, John Cho, Jack Davenport, Zachary Knighton, Peyton List, Dominic Monaghan, Brian F. O’Byrne, Courtney B. Vance, Sonya Walger, and Christine Woods. The series debuted on September 24th on ABC. The premiere attracted a 4.0 rating in the 18-49 demographic and 12.47 million viewers. The following week, the number dropped to a still very respectable 3.7 and 10.73 million. For week three, the ratings dropped again to a 3.0 and nine million. Then, over the next several episodes, the all-important demo dropped to a low of a 2.1 rating with just 7.1 million viewers. To make matters worse, after 10 episodes, ABC took the show off the air for three months. The spin was that this was a positive thing, allowing the network to promote it and essentially relaunch the program. They tried but, as expected, the numbers were even worse when FlashForward returned in March. Do you think FlashForward will get a second season? Last night’s episode fell to a new low for the series. It attracted a truly horrible 1.3 rating in the demo and 4.75 million viewers, per the overnights. When a show comes in at fifth place in the demo, behind The CW, you have a disaster on your hands. While it was once considered that FlashForward was on the bubble for renewal, it’s now clear that there’s no way ABC will bring this show back next season. The ratings are just too low. Sadly, that very likely means that viewers won’t get all of the answers they’ve been craving. There are only three episodes left so at least we know that ABC will let them all air. What do you think? Why do you think that FlashForward didn’t catch on? The big hiatus didn’t help but the ratings kept sinking even before that. Not a good enough show? Now i see why this show was cancelled…birds falling from the sky? Dead crabs by the millions? This show really was ahead of it’s time. I am so disappointed that this show ended. I was really into it. I loved the characters and the plot. I think its because of poor choice of music and sound affects in certain scene, poor plot lines and from many people have told me, the story just wasn’t good. This was the NEW LOST in my book.